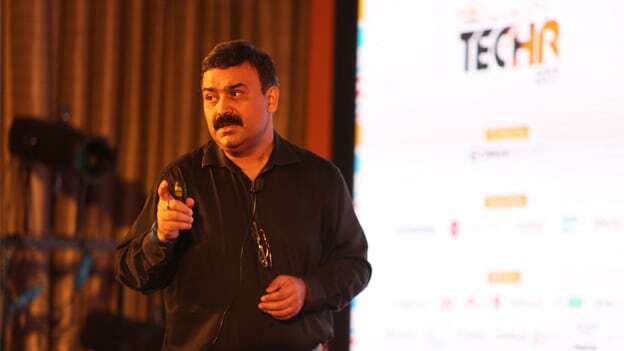 In another interesting session at Day 2 of People Matters TechHr 2017 conference Abhijit Bhaduri, founder of Abhijit Bhaduri & Associates explained the concept of 2 speed leadership model allegorically with the use of symbol ‘&’. He said, the symbol ‘&’ is not only useful to him but it also helps to describe the world we are living in. ‘&’ is a symbol of coexistence as analog also exists with digital. Organizations that are not born digital need to figure out ways to co-exist with others. People in businesses have certain kind of profiles and certain kind of leadership styles and in parallel, they need to prepare for future leadership. The major challenge for organizations today is to build such organization structure that leads both. Now the big question for organizations is – how to integrate the entity you acquired. Most acquired businesses do not fail or succeed because of market rate or the product or other businesses challenges, they fail because integration of human hearts has not happened. Organizations which are acquired they always have a feeling that they are bought over and they need to submit to their new master. Human beings have a tendency to retain their identity and then connect with any organization or group. Leaders who are able to use data as an important element of leadership style and who are able to translate the data and inspire the people are quite few which are successful. No doubt, you can use data support to draw analysis but in the end what you do with the data as you convey to people is still a human skill. As a manager when you evaluate a person’s performance from the data, it is easy to convey a positive message but real skill comes in when you need to convey to your team member that he/she hasn’t performed that well. It’s how you deal with that tough conversation is all that matters. Does it leave you inspired or does it leave you dejected? That is actually 2 speed leadership skill that can be used at the individual level. The challenge for HR is going to be that its rigidity and in order to be acceptable it needs to give up its ‘one size fits all’ model in the future. HR will need to leverage on all possible sides in order to succeed.